Bring on the fun with custom tangram puzzles from Pinhole Press. Personalize with your child's name and photo and create a tangram your child is sure to love. Tangrams are so much more than fun. Children learn about spatial relationships, develop creativity, build hand and eye coordination and learn shape identification as they use tangram puzzle pieces to come up with different objects and shapes. Tangram puzzles have seven pieces. Each piece is called a tan. Tangrams are designed to inspire creativity. Our customized tangrams give children an extra incentive to play, learn and grow. 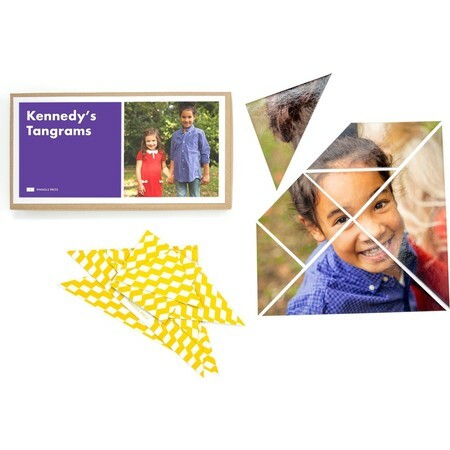 Flip the tangram puzzle pieces over, and your child has a custom tangram puzzle complete with favorite photos. Easily customize tangram puzzles for your child with one photo for the puzzles and another for the box. Select your preferred color options and personalize the box with your child's name. Puzzles pieces have a glossy finish, and each set contains two tangram puzzles.